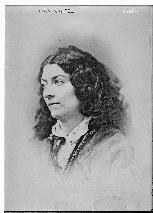 Lola Montez was born as Maria Dolores Eliza Rosanna Gilbert. Her father was a Scottish officer and her mother was a Creole of 14 years old when she was born. After her father's death in India her mother married Major John Craigie, who also was to serve in India. She was educated at border schools in England and France. When she was 16 her mother wanted her to marry an elderly judge, but she ran away with Lieutenant Thomas James and she married him in Ireland. In 1839 they went to Simla, India, but after ran off with another woman she returned to England. James divorced her because of a relation with another man on the ship that took her back. She went to Spain where she was educated as a dancer. She debuted in 1843 in London as Lola Montez, but after she was recognized as the former Mrs. James she left England and performed her Spanish dances in European cities. She had affairs with Fransz Liszt, Alexandre Dumas (père), Alexandre Dujarier and others. She always carried a riding whip and more than once she slashed a man in the face after he had made her angry. Her affair with Liszt took place in Dresden and was passionate and stormy. She was jealous of his many female admirers and caused a scandal during a dinner. Liszt soon grew tired of her, waited until she slept, locked the hotel room and left. He left money at the desk of the hotel because he expected her to smash the furniture the next morning. Dujarier, co-owner of "La Presse", was possibly her greatest love of all, but he was killed in a duel on 11 Mar 1845 shortly after their liaison began. She moved on to Munich, where she pretended to be of Spanish nobility. King Ludwig I saw her dance and feel deeply in love with her. She was his fiftieth mistress and she had a huge influence on him. In 1847 he created her Countess von Landsfeld, but the Bavarian nobility protested and refused to have anything to do with her. Her political influence became enormous and she practically ruled the kingdom for a while. Prince Metternich even offered her a fortune to leave Munich, but she refused. In 1848 riots broke out against her and she was forced to flee to Switzerland. Ludwig abdicated as king of Bavaria. In 1849 she returned to London, where she married George Trafford Heald, an officer. On august 6th she was arrested for bigamy and anfrer her release she went with him to Spain, where he drowned in 1850. She continued her dancing career in Europe and in the United States, but scandal followed her wherever she went. In the USA she married the owner of the San Francisco Whig, Patrick Purdy Hull, but soon he wanted to divorce her. Before he could do so he was shot under unknown circumstances. In 1855 she went to Australia and when she left Sydney she was almost arrested because of her debts. She went to Melbourne and Adelaide and when she returned to Australia her young manager died after falling overboard, again under unclear circumstances. Back in the USA she opened a saloon in Grass Valley where she performed herself. It was visited by many Governors and Senators and she tried to gain influence as part of a plan to declare Califiornia independent of the USA and rename it to Lolaland with herself as its queen. It never happened. Her body was aging rapidly, possibly caused by syphilis. After a collapse she moved to New York, where she spent her last two years in poor circumstances. A month before her fortieth birthday she died of pneumonia. Her two children refused to claim her body. One had a lamp shade store in California, the other was in jail. 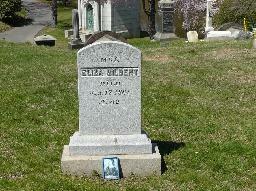 She was buried in Greenwood Cemetery, Brooklyn as Mrs. Gilbert. Her tombstone states she was in her 42nd year, but this is incorrect. The grave of Lola Montez at Greenwood Cemetery, Brooklyn, New York City. "Lola Montez" painted by Joseph Stieler (1847, Schloss Nymphenburg, München).